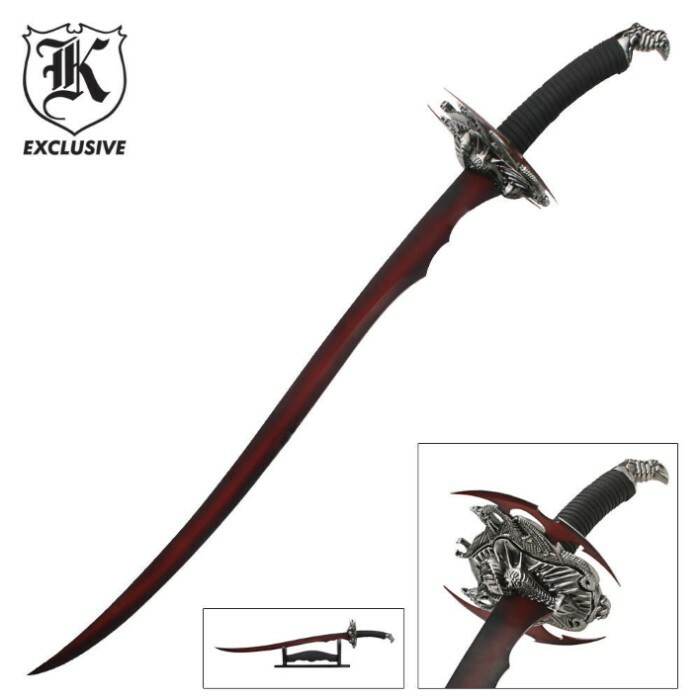 Red Dragon Scimitar Sword | BUDK.com - Knives & Swords At The Lowest Prices! The Red Dragon Scimitar Sword measures 33 1/2" overall and features a 21" curved stainless steel blade with a deep red finish. 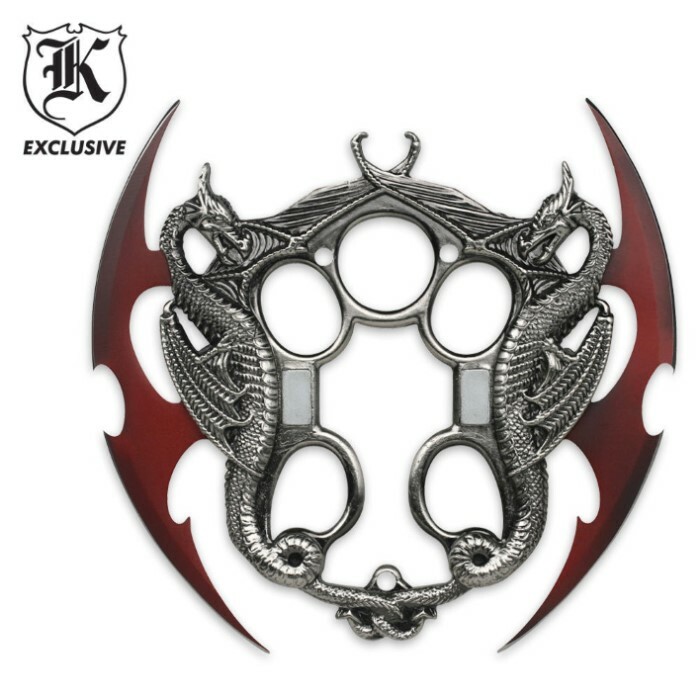 This sword offers a distinctive double dragon themed magnetic guard that is removable from the hilt. This uniquely crafted sword includes a wooden display stand to easily show off this superb fantasy piece! A very nice sword. The magnetic blade comes off and can be used separately, but it's not so easy to put back on... You have to make sure the leather grip doesn't bunch up or it won't attach right. It came in razor sharp, and is NOT a toy... the paint will come off with use, but it is a display piece... the stand seemed wobbly at first, but if you put the interlocking vertical pieces all the way in, so that they are further down than the horizontal piece, it stabilizes out. all in all, a good display piece. Super light weight easy to handle and looks fantastic. The magnets do not hold as good as id hoped but for the quality of craftsman ship that you get its a minor set back. I just received the Dragon Scimitar this morning. The Sword is very cool. I do have some slight paint blemishes but that is to be expected for something at a price like this and they aren't too noticable by novice eyes. It feels very sturdy and the handle feels great. The scabbard is nice quality as well. I thought the magnet system used to "hold" it to the sword wouldn't work but a few shakes and test swings put that doubt to rest. Overall a nice product, only took 2 days to get here. I will buy from TrueSwords anytime I feel like getting a new weapon. The blade and sword itself is beautiful. However when I received my sword the plastic that protected the point was broken and the actual blade was bent much to my frustration. However it is still a beautiful blade and I would most likely buy another one. This sword is pretty sweet and fairly heavy with the handle attachment. It's not super sharp but it pierced the box it came in easily. I like and recommend this sword to anyone who wants a high quality, good looking, yet effective sword. The only complaint I would have to say is a small piece of the wooden stand chipped and I needed to glue it on. Other than that very good ****.